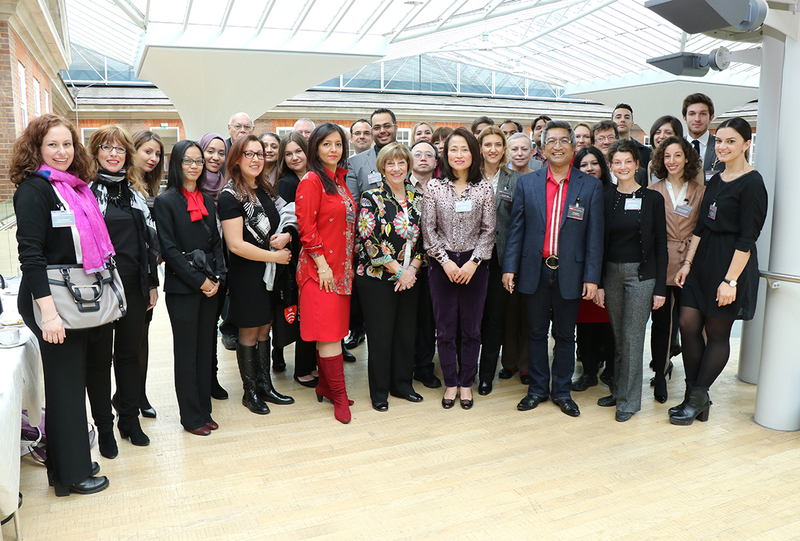 Middlesex University academics, researchers and students were joined by experts from all over the world at the prestigious Corporate Marketing and Communications Conference (CMC) 2016 hosted by the Department for Marketing, Branding and Tourism. The event presented a great opportunity for those in the field to hear talks by world-renowned academics and researchers, and discuss issues from the role of communications in corporate social responsibility to the impact of branding on everything from youth culture to the cities we live in. Professor Rosa Chun (pictured in discussion with Professor TC Melewar), Chair in Global Leadership, Reputation and Responsibility at University College Dublin, delivered the opening keynote speech on the topic of ‘Corporate Communication in the Age of Disrepute’ – a topic that was particularly pertinent in the wake of both the FIFA ethics scandal and the Panama Papers revelations of corporate tax avoidance. Given these current hot topics about practices and cultures in large organisations, Professor Chun addressed the most important aspects of communications in improving the reputation of an organisation, namely gaining the confidence of staff. She went on to say that the most important dimension in gaining this trust is what she terms “agreeableness”, suggesting that factors such as trust, integrity and social responsibility were all key to driving satisfaction in an organisation. An example of this is reputation recovery after a PR crisis, when a CEO will apologise – with importance placed on ensuring the apology is culturally appropriate. Admitting that academics face a challenge in translating research on the issue of communications in corporate social responsibility into teaching that resonates with their students, Professor Chun said that presenting case studies on well-known organisations such as FIFA is an excellent way of engaging a class. “I asked, ‘What is wrong? How should FIFA change their culture? What is necessary to improve the culture?’ Students were shocked to hear about the case as many of them liked football, and even those who didn’t were touched by the World Cup,” she explained. Professor Chun’s views set the tone for the conference, with the issue of ethics and the embedding of marketing research knowledge in teaching appeared in later talks including ‘An Investigation of UK Youth Tribes: A Fashion Marketing Perspective’ and ‘The State of Integrated Marketing Communications in the Classroom’. 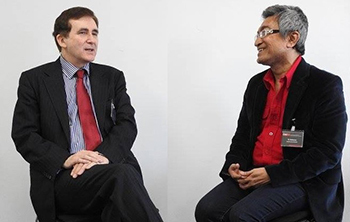 These themes also resonated with the conference’s second keynote speaker, Professor Nicholas O’Shaughnessy of Queen Mary University, London (pictured in discussion with Professor TC Melewar). His talk raised the question of whether or not current teaching in marketing captures the essence of modern practice. Key to this is the idea that everything about an organisation talks, and therefore branding and PR are central elements of practice that need to be considered more prominently within the academic realm. Professor O’Shaughnessy believes that a rebalancing of the subject is needed to bring the main themes of practice into the academic sphere. Like Professor Chun, he also feels it is important that research conducted by academics is used in the teaching of a subject. “The idea of embedding research in your teaching is very, very important and is an essential part of academic research,” he argued. Professor O’Shaughnessy also discussed recent developments in marketing, particularly digitisation, which are impacting not only in areas such as publishing and advertising but also on what students are learning in the classroom. What became most clear over the two days of the conference is that the field of marketing and communications is a highly vibrant subject, one that not only takes in many areas of academia from sociology to technology but also a field that requires continual self-reflection, with the understanding that in today’s fast-moving world of brand trends, digital media and shifting social media landscapes, it simply has to.